Let go of your pretensions—squeeze, shape, knead & play your way to spiritual growth. "I am being formed by the clay. I am reconnecting with the earth, and with the other basic elements, too—air, water, fire—and life itself. Every gesture leaves its trail in the clay. Every fingerprint, a message. My breath fills the cavity. My touch curves the wall of a bowl. And inwardly, I am being formed by the outward practice. I am learning to trust the process, to lean into the possibilities rather than striving for some predetermined goal. I am being hollowed out, stretched and constricted, trimmed and sometimes reworked entirely. 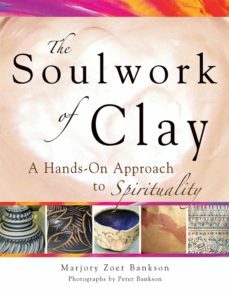 "—from the PrologueDrawing from her first-hand experience of working with clay, Marjory Zoet Bankson takes you through the seven-step process of making clay into a pot, drawing parallels at each stage to the process of spiritual growth:Grounding—Connecting with our core elementsKneading—Awakening to the inner realm Centering—Gathering everything togetherShaping—Focusing inner and outer pressures Finishing—Trimming away the excessDecorating—Adding a playful touch Firing—Committing to transformationThis simple connection with the earth has the potential to put you in touch with the whole of creation and, at the same time, your souls longing to participate as an artist, creating something new and unique.Through reflective questions in each chapter—along with a wealth of unique clay projects that even beginners can do—Bankson invites you on a journey of spiritual discovery, a path of reconnecting with your body and spirit, and with the earth itself.